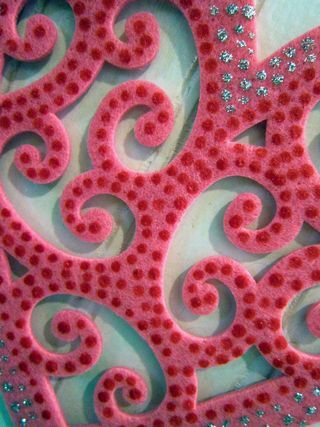 Free Pattern :: DIY Sparkly Valentine Coasters / Placemats / Decorations. I love Valentine's Day! All the pink and red. These quick decorations can be completed in under a 20 minutes each and are great to do with children (7 and older). Not in a Valentine's Day mood? Well, apply the same idea to any other felt diecut. A Christmas tree with Beads in a Bottle used for ornaments! Same with easter eggs! Lots of fun here. small piece of aluminum foil (3" x 3"
Squeeze dots of glue around the edge of the heart. Sqeeze a small amount of glue onto the foil. Pour out a small amount of sequins near the foil. Dip the toothpick lightly into the glue. Use the toothpick to pick up the sequins and position them into place on the heart. You may need a 2nd toothpick (without any glue on its tip) to push the sequin into place. Once dry, use the Pearl Pink Beads in a Bottle to squeeze random dots. If you have a heart with a lacy pattern as those in the sample, follow along the die cut pattern. Allow to dry before moving. Use the Semiprecious Gold Beads in a Bottle to squeeze random dot working your way from the interior to exterior of the heart. If you have a heart with a lacy pattern as those in the sample, follow along the die cut pattern. Use the Gemstone Red Beads in a Bottle to fill the interior of the heart with random dots. Use Semiprecious Silver Beads in a Bottle to squeeze random dots along the perimeter. If you have a heart with a lacy pattern as those in the sample, follow along the die cut pattern. Hang your collection from a chandelier. Install them on the wall. I scattered mine throughout the house for use as coasters.